Introduce multi room audio and home entertainment seamlessly through your smart home. Encompass yourself in perfect sounds or connect to your smart network to enhance functionality. Enjoy your favourite music in every room with smart multi-room using motion sensors. Why not, integrate your entire system to your “all off” feature offering a single control to switch off every smart device? Smart audio provides endless possibilities - See what smart home audio can achieve. Always wanted a home which can help you through speech? Well now you can ! Smart audio provides endless speech functionalities to support your home life. Simply synced to sensors around your smart home, you’ll have the ability to create any audio you desire. Enjoy receiving a welcome greeting when entering your vacant home to provide a warm welcome back. If you always forgetting the small things to do. Let your smart home provide reminders at the precise time you need to complete a task. Extend the possibilities by linking your text-to-speech function to any smart system to create your bespoke smart home. Using audible alerts for security to personal preferences. Creating a unique experience within your smart home has never been easier. Forget missing someone at the door again with custom doorbell sounds in all active rooms. Take advantage of the best alarm clock you could wish for. Wake up to your feel good playlist or favourite song to start your day in perfect fashion. Why not link your audio system to your security for a bespoke alarm? Sometimes silence is perfect - Worried about waking the kids? Transform your audio experience with smart multi-room. You will never have to plan how to listen to music again. 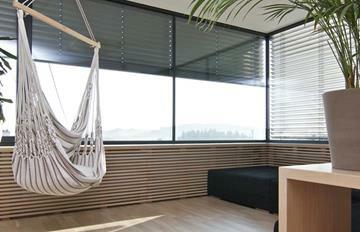 Smart multi-room will allow the audio to be played only in the rooms you are in, so you will never miss another beat. 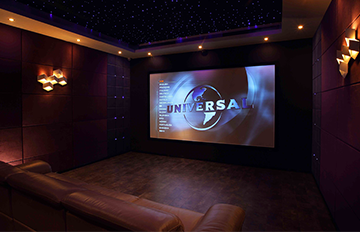 Multi-room enables a flexible solution whereby music can be played simultaneously in different rooms to create the perfect atmosphere in every room. Subtle integration of smart audio system gives the perfect sound with minimal exposure of speakers. 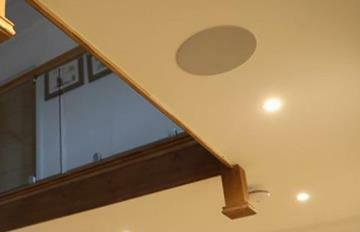 Enjoy the ability to introduce ceiling and wall speakers for bespoke solutions. You do not have to bring large equipment into your home. Your new audio system will also be able to link with your current sound system - providing the best sound from a familiar source. Control your smart system with convenient solutions such as your app, smart switches or sound system. Your audio system seamlessly links to any smart device or music service to suit you. Integration with smart switches provides an easy point of control from volume to skipping tracks are a single touch. Whilst your whole audio system will be controllable from your smartphone. 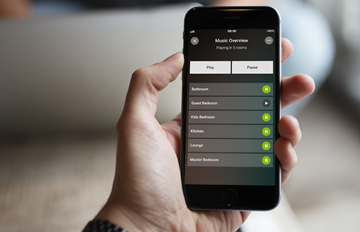 Enjoy a unique presentation and control of what’s planning and in which rooms, the ability to change volume, choose playlists and skip songs. Smart audio - Endless possibilities, always at your fingertips.